Spring is on the horizon and so is Little J’s second birthday! Snow is melting, Canadian Geese are in the fields and the sun is back. Change and growth are once more on the tips of the tongue. In this house that translated to haircut time. Yesterday we all got haircuts, Josh, Mom (me) and Little J! My baby got his first haircut. It was a bit nerve-wracking leading up to the haircut as we didn’t know what to expect. We weren’t sure if he’d hate the experience or simply not have the experience because he wouldn’t even let anyone else close to his head. Well it turns out, he was a pretty cool dude and now looks very good. We took him to a local hair dresser in Lakota. Josh called ahead for advice on the best way to approach the situation explaining that he needed a cut for himself and for his son. The stylist who’s familiar with our family, recommended I come along to help Little J feel settled and she would cut Josh’s hair first and then Little J’s. I packed a bit more in Little J’s bag than the usual change of clothes, snacks, water and diaper. I also packed three books I knew he’d be interested in, two toys that give him comfort and if all else failed the iPad with his favorite games. When we arrived and our stylist Jeanne greeted us all and then got started with Josh’s haircut. Meanwhile Little J and I sat in a chair close by and read books quietly together. Every now and then Little J would look up with curiosity at dad, I’d say something about how nice Josh looked and return to reading. There were a few toys at the salon and Jeanne encouraged us to check them out. We did for a bit and returned just in time for the end of Josh’s haircut. (He looks very nice now by the way…) Then it was Little J’s turn. Jeanne was so great with him. We sat him down in the stylist chair with a booster seat and then we selected a toy for him to keep the focus of his attention away from his hair. We selected an abacus which he’d taken a particular interest in from the salon’s box of toys. He really enjoyed exploring this new toy and really didn’t worry so much with his hair. I stooped next to him and counted on the abacus with him. It wasn’t until we tried to use the trimmer that we met any resistance and even then it wasn’t more than a wave to the hand that said…. nope not doing it! I tried bringing the iPad out but that didn’t ease his concerns about the trimmer. I supposed we could have pushed the issue but really it wasn’t necessary so we just skipped that part. He still looks great! We never thought of saving his hair but Jeanne did! She cut a bit and gave us in a cute little baggie along with a certificate to commemorate Little J’s first cut! The entire experience was awesome and Little J was so brave. He made his parents very proud. If you live in the area and are nervous about your little one’s first haircut I highly recommend a visit to 218 Main Salon, Lakota ND. 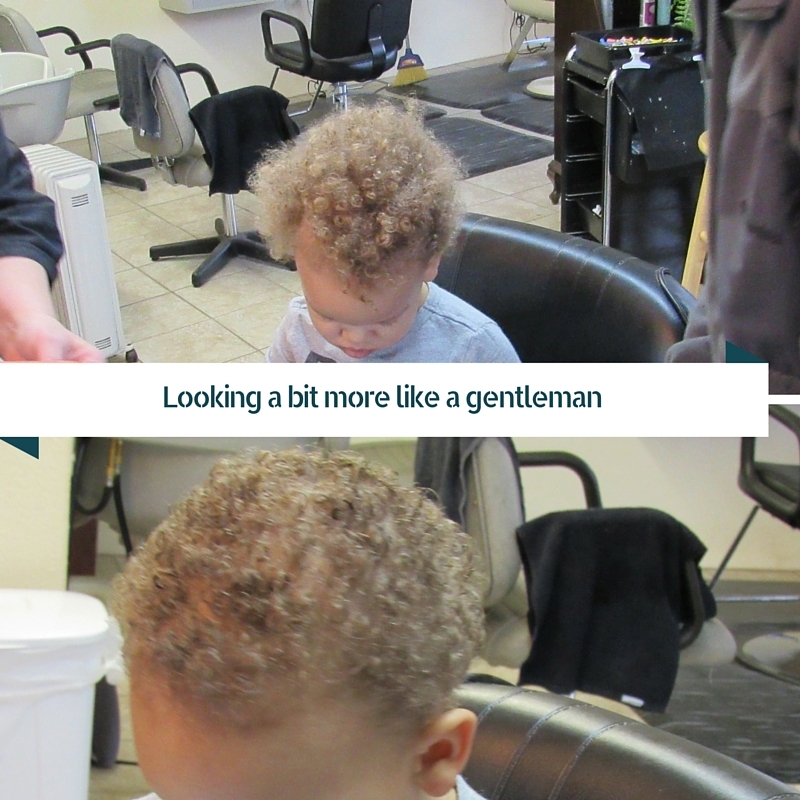 Jeanne Shirley the owner and our stylist is wonderful and we couldn’t be happier with our son’s experience there. Dad and Little J weren’t the only ones who got their hair cut yesterday though. I straightened my hair late last year as I was tired of my natural hair and not knowing how to style it. That was a mistake. My hair breaks from relaxers but I had hope that this time would be different. Not only was it not any different but it quickly lost its allure and I found myself missing my natural hair. So I cut it off. Now I’m sporting a small cute afro again. I am not one to be overly sentimental with my hair. In all honesty I enjoy playing around with it and it grows back so I’m not worried. What I hope to do better this time though is master my natural hair. My hair goals are less centered around length, though I hope to eventually achieve that too, and more oriented to health. Healthy hair has to be my main focus after all the trauma I put it through recently. 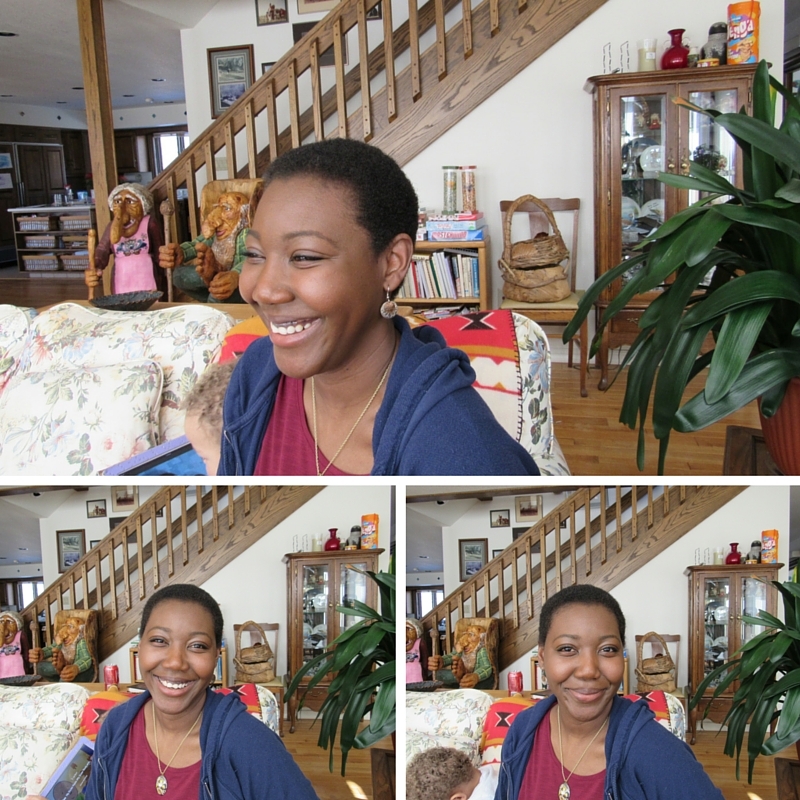 A cute haircut – a great way to beacon Spring. Hope you are all well.